With the final vote on Europe’s Copyright Directive coming up next week, campaigning efforts from both supporters and opponents are reaching new heights. Earlier this month hundreds of organizations from the creative industries called on the European Parliament to quickly adopt the proposals. These organizations were later followed by many individual creators. These supporters stress that the planned Copyright Directive will help them to protect their rights and get fair compensation for the use of their works on the Internet. 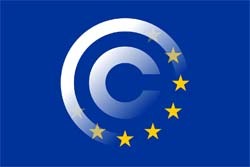 This is also the message that EU copyright rapporteur Axel Voss is trying to convince the public with. On the opposing side, there hasn’t been any shortage of action either. Today the “Stop the censorship-machinery! 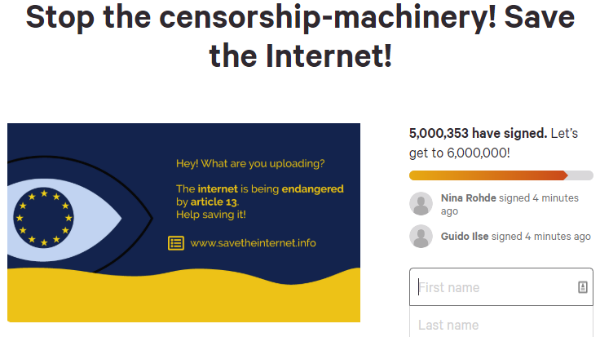 Save the Internet!” petition passed five million signatures, making it one of the largest to be hosted on the platform. The petition is part of a broader campaign. It has been up for months, but this latest milestone will undoubtedly be used to convince members of the EU Parliament to reject Article 13 and Article 11 in the upcoming vote next Tuesday. Several well-known digital rights groups have also launched the Pledge2019 campaign, encouraging people to contact their representatives in the EU Parliament. According to the latest stats, 121 MEPs have thus far pledged to vote against the Copyright Directive. There are anti Article 13 website blackouts scheduled as well, which we also saw with the anti-SOPA protests several years ago. The German version of Wikipedia is going dark for 24 hours today, for example, and it is joined by the Slovak edition. Offline there are also several demonstrations planned around Europe, from Portugal all the way to Finland. 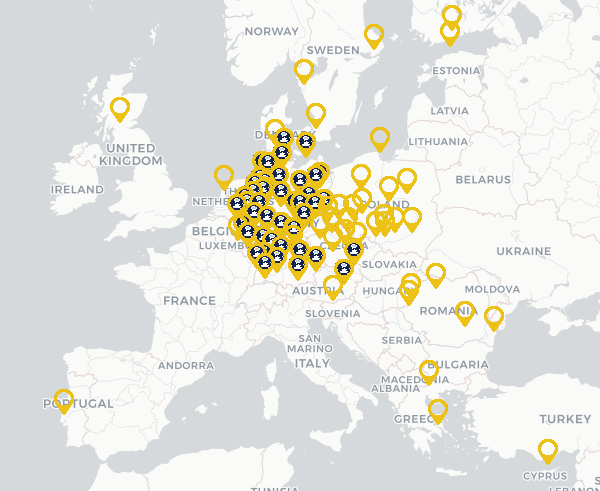 However, much of the protest is centered in and around Germany where the public has been very vocal about the Copyright Directive plans. The Copyright Directive is a hot topic in German politics at the moment. Last Friday, Germany’s largest political party, CDU, announced a plan to prevent “upload filters” in the country. Instead, large Internet platforms should pay flat-rate licensing payments to copyright holders. This proposal, which assumes the Copyright Directive will pass, has been widely criticized too. As the vote nears, the atmosphere is becoming more grim. Last weekend, German police investigated a bomb threat directed towards the office of Axel Voss. Meanwhile, some press publishers reportedly threatened Parliament Members with bad press if they vote against the Copyright Directive. With less than a week to go, the campaigns from opponents and supporters will soon reach their climax. Then, it’s up to the Members of the European Parliament to have their final say. 17 Years in JAIL for IPTV ! !